StreamStats is a Web application that provides access to an assortment of Geographic Information Systems (GIS) analytical tools that are useful for water-resources planning and management, and for engineering and design purposes. The map-based user interface can be used to delineate drainage areas for user-selected sites on streams, and then get basin characteristics and estimates of flow statistics for the selected sites anywhere this functionality is available. StreamStats users also can select the locations of U.S. Geological Survey data-collection stations, shown as triangles on the StreamStats map, and get flow statistics and other information for the stations. 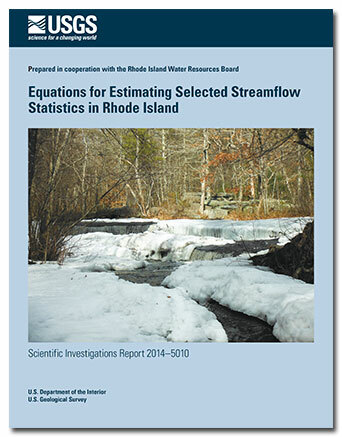 The types of flow statistics that are available vary from state to state. A variety of additional tools are available for discovering information about streams and the activities along them. StreamStats works within Web browser software on personal computers and mobile devices, and is best viewed using the latest versions of Internet Explorer, Microsoft Edge, Chrome, or Firefox. The browser must allow HTML5 asynchronous script execution. The application is being continually improved and expanded. The ActiveNews/Status link will provide notices of any new enhancements. Additional documentation can be accessed through use of the About and Help buttons in the black banner above the map in StreamStats. The page that appears after clicking on the About button includes three tabs. The About the Project tab provides a brief description of StreamStats. 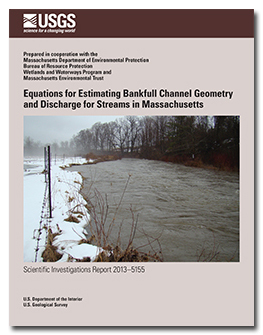 The State/Regional Info tab provides (1) a description of the streamflow statistics that can be estimated by use of regression equations for the state that the user has selected, (2) citations for the reports that include the equations, (3) notes and cautions that are specific to using StreamStats for that state, (4) a link to information about the geospatial data used to implement the state, and (5) information about the agencies that cooperated with the USGS to implement the application. The News tab provides access to a list of notes that describe recent and older changes to StreamStats. The Help button on the user interface provides access to the users’ manual, a list of frequently-asked questions and answers, and a form that users can fill out to request support or submit comments to the StreamStats development team. Unless otherwise stated, all data, metadata and related materials are considered to satisfy the quality standards relative to the purpose for which the data were collected. Although these data and associated metadata have been reviewed for accuracy and completeness and approved for release by the U.S. Geological Survey (USGS), no warranty expressed or implied is made regarding the display or utility of the data for other purposes, nor on all computer systems, nor shall the act of distribution constitute any such warranty. 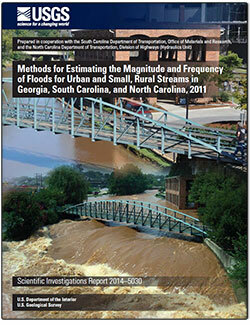 This software has been approved for release by the U.S. Geological Survey (USGS). 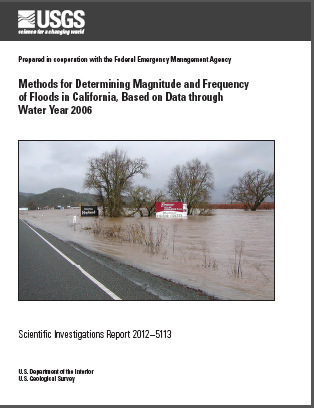 Although the software has been subjected to rigorous review, the USGS reserves the right to update the software as needed pursuant to further analysis and review. No warranty, expressed or implied, is made by the USGS or the U.S. Government as to the functionality of the software and related material nor shall the fact of release constitute any such warranty. Furthermore, the software is released on condition that neither the USGS nor the U.S. Government shall be held liable for any damages resulting from its authorized or unauthorized use. Below is a list of reports and presentations on StreamStats. If you have any further question, please contact us. Ries, K.G., III, Guthrie, J.D., Rea, A.H., Steeves, P.A., and Stewart, D.W., 2010, Use of the StreamStats Web Application for TMDL Analysis, in Proceedings of TMDL 2010: Watershed Management to Improve Water Quality, November 14-17, 2010, Baltimore, Maryland, Association of State Agricultural and Biological Engineers, 7 p., online at http://elibrary.asabe.org/conference.asp?confid=tmdl2010. Ries, K.G., III, Horn, M.A., Nardi, M.R., and Tessler, Steven, 2010, Incorporation of water-use summaries into the StreamStats web application for Maryland: U.S. Geological Survey Scientific Investigations Report 2009-5111, 18 p.
Ries, K.G., III, Steeves, P.A., Guthrie, J.D., Rea, A.H., and Stewart, D.W., 2009, Stream-Network Navigation in the U.S. Geological Survey StreamStats Web Application, pp. 80-84. Guthrie, J.D. Dartiguenave, Christine, and Ries, K.G., III, 2009, Web Services in the U.S. Geological Survey StreamStats Web Application, pp. 60-63. Ries, K.G., III, Guthrie, J.D., Rea, A.H., Steeves, P.A., and Stewart, D.W., 2008, StreamStats: A Water Resources Web Application: U.S. Geological Survey Fact Sheet 2008-3067, 6 p.
Below are other science projects associated with StreamStats. Below are publications associated with StreamStats. Ries, Kernell G.; Newson, Jeremy K.; Smith, Martyn J.; Guthrie, John D.; Steeves, Peter A.; Haluska, Tana L.; Kolb, Katharine R.; Thompson, Ryan F.; Santoro, Richard D.; Vraga, Hans W.
Bent, Gardner C.; Steeves, Peter A.; Waite, Andrew M.
Equations for estimating selected streamflow statistics in Rhode Island; 2014; SIR; 2014-5010; Bent, Gardner C.; Steeves, Peter A.; Waite, Andrew M.
Olson, Scott A.; Bent, Gardner C.
Annual exceedance probabilities of the peak discharges of 2011 at streamgages in Vermont and selected streamgages in New Hampshire, western Massachusetts, and northeastern New York; 2013; SIR; 2013-5187; Olson, Scott A.; Bent, Gardner C.
Bent, Gardner C.; Waite, Andrew M.
Equations for estimating bankfull channel geometry and discharge for streams in Massachusetts; 2013; SIR; 2013-5155; Bent, Gardner C.; Waite, Andrew M.
Computed statistics at streamgages, and methods for estimating low-flow frequency statistics and development of regional regression equations for estimating low-flow frequency statistics at ungaged locations in Missouri; 2013; SIR; 2013-5090; Southard, Rodney E.
Regional bankfull-channel dimensions of non-urban wadeable streams in Indiana; 2013; SIR; 2013-5078; Robinson, Bret A.
Eash, David A.; Barnes, Kimberlee K.; Veilleux, Andrea G.
Methods for estimating annual exceedance-probability discharges for streams in Iowa, based on data through water year 2010; 2013; SIR; 2013-5086; Eash, David A.; Barnes, Kimberlee K.; Veilleux, Andrea G.
Koltun, G.F.; Kula, Stephanie P.
Methods for estimating selected low-flow statistics and development of annual flow-duration statistics for Ohio; 2013; SIR; 2012-5138; Koltun, G. F.; Kula, Stephanie P.
Feaster, Toby D.; Guimaraes, Wladmir B.
Low-flow frequency and flow duration of selected South Carolina streams in the Saluda, Congaree, and Edisto River basins through March 2009; 2012; OFR; 2012-1253; Feaster, Toby D.; Guimaraes, Wladmir B.
Linhart, S. Mike; Nania, Jon F.; Sanders, Curtis L.; Archfield, Stacey A.
Computing daily mean streamflow at ungaged locations in Iowa by using the Flow Anywhere and Flow Duration Curve Transfer statistical methods; 2012; SIR; 2012-5232; Linhart, S. Mike; Nania, Jon F.; Sanders, Curtis L., Jr.; Archfield, Stacey A.
Zarriello, Phillip J.; Ahearn, Elizabeth A.; Levin, Sara B. 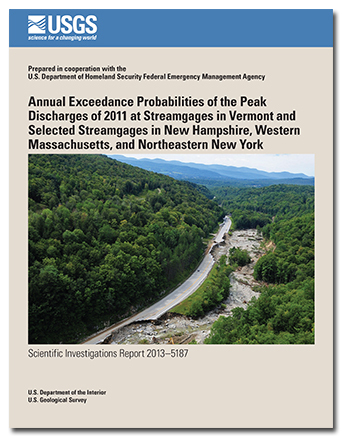 Magnitude of flood flows for selected annual exceedance probabilities in Rhode Island through 2010; 2012; SIR; 2012-5109; Zarriello, Phillip J.; Ahearn, Elizabeth A.; Levin, Sara B. Below are data or web applications associated with StreamStats. Below are multimedia items associated with StreamStats. Below are news stories associated with StreamStats.